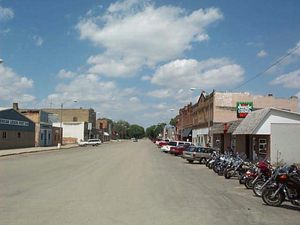 Sometimes the towns are so small that there is only one Main Street. Ellsworth, Kansas If you get to the cafe much after, say, noon, the Special is all gone and only sandwiches are available. The major store is the hardware and feed store. But there is, almost always, a library. And there is always some combination of town offices. Our genealogy travels in 2001 took us first to South Dakota and Kansas. The following report is largely taken from the logs we made at that time. 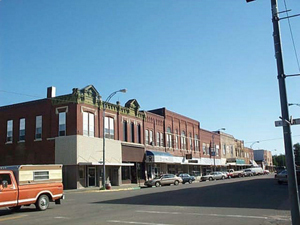 In downtown Aberdeen, South Dakota, the office of the Register of Deeds holds photocopies of grant deeds, tax deeds, plats, probate records, all neatly bound in big binders. The clerk showed us where things were and left us to work on our own. Imagine doing that in your town! Pretty soon we were finding records of land transfers dating back to the days of the Dakota Territory. With the aid of the plats we found out where the relatives lived and worked and were buried. Our big success was finding the probate record for Elsa's great-great grandfather, Aaron Bell, who died in 1894, leaving his farm and $350 to his wife and seven children (three more children had died). The Groton Independent offices turned out to be a gift and floral shop, doubling as a newspaper office. A little Sheltie dog ran around checking us out. So we learned how tiny towns survive: by combining lots of part-time activities. The proprietess was just as helpful as the library / city hall staff, finding us a table to work and handing us ancient, cardboard bound files of browned and brittle nineteenth-century papers, full of news. John Wanamaker was purchasing land in Philadelphia; a young woman won her breach of promise suit against a congressman and had a nervous collapse right there in court (in Washington, D.C.); Coxey's army was protesting the lack of support for the unemployed veterans; lots of bargains could be bought for nineteen cents each. Then we found Aaron Bell's obituary. 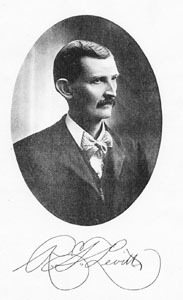 It turned out Aaron and his wife Jane had moved to Dakota territory in 1887, to be near their son John, who had pioneered three years earlier. We made an extra photocopy for the library's obituary file. Forty-seven cents for the photocopies seemed like too little, so we managed to leave a little more, in hopes that the proprietess would still be in business for the next genealogy buff that comes to town. 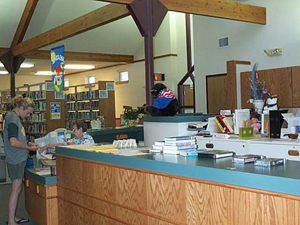 Ellsworth and Wilson, Kansas, each have a town library, and Ellsworth Public Library each has a couple of microfilm readers and reels of newspapers from over a hundred years ago. We spent a couple of days hunched over microfilm readers, reading old marriage records and obituaries. 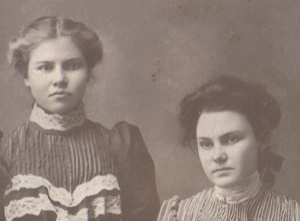 We found two great uncles who briefly owned a department store in Wilson and paid to have long flowery biographies placed in a book entitled Biographical History of Central Kansas. But for the most part, these people went to high school, then got married, farmed the land, raised cattle and families, and went to church. The death of a 9-year-old great uncle was reported in the Ellsworth Reporter for 19 Jun 1879: Drowned -- Last Friday Edward Cadwell, in consequence of the severe rain storm, started for the school house, west of Postmaster Jackson's place, with a team, to take home any of the children belonging in his neighborhood. He got to the school house and having noticed on his way the creeks were rising he concluded that it was best to hurry back, which he did as soon as he could get the children in. When he reached a branch of Ash Creek he did not notice that the water had risen very high, so he plunged in. The current was so swift that the wagon was at once upset and the occupants thrown out, drowning young Cadwell and carrying the team downward till they, too, were drowned. The oldest of the three saved, was a young girl about 15 years old, who happened to be thrown where the water was more shallow and being self possessed, she caught one of the younger ones by the hair as it was R. Thomas Levitt going down, and rescuing the other also, thus showing courage in an hour of great peril to herself. Mr. Cadwell was a young man and his loss will be severely felt by his parents and friends. they have the heartfelt sympathy of the community in their deep affliction. The Ellsworth Reporter for 8 Jun 1922 told of an old sick bachelor who committed suicide: Thomas Levitt, a prominent citizen of Wilson, Kansas, committed suicide at the home of his sister Mrs. Rowe Tuesday evening. Shortly before five o'clock Tuesday afternoon Mr. Levitt went to his room, took a 12-gauge shotgun that was standing in the corner, placed the barrel to his heart and pulled the trigger. Mr. Levitt had Florence and Louise Cadwell been in poor health some time past. He is reported to be well fixed financially. The big social organizations here were the Odd Fellows and the Knights Combines waiting of Pythias. A hundred years ago there were racist stories; fifteen years after that we were fighting the Huns. We read quite a bit of other news and gossip, too, all jumbled together. The big social organizations here were the Odd Fellows and the Knights of Pythias. A hundred years ago there were racist stories; fifteen years after that we were fighting the Huns. And the paper was unabashedly Republican. 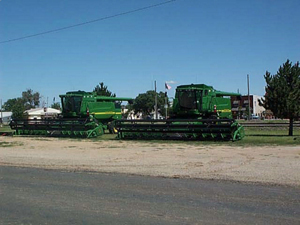 When a combine moves through the wheat, clouds of chaff blow out behind and the kernels shoot up to a bin behind the driver. Cake pans for loan at library Trailer trucks full of wheat are parked at the elevators. (It rained last night, so, as all the local papers noted, the wheat harvest will be on hold for a few days until the wheat dries out again.) Everybody waves to everybody on the dirt roads, but not necessarily on the state highway. 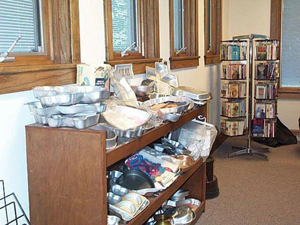 One of the libraries has a few bookshelves filled with cake pans of various unusual shapes. One can borrow these, just like books. The children like to pick out the shape of cake pan to have for their birthday parties.